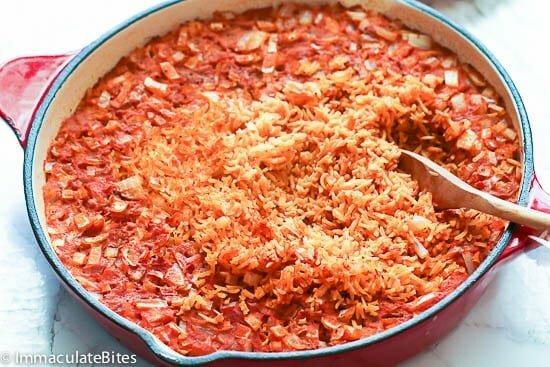 Mexican Rice -Baked and Stovetop tender and amazingly delicious rice recipe that’s perfect for entertaining or for regular days. It taste even better than those you pay at restaurants. Minimal prep time with optimal result – comes in 2 methods for your convenience! Before Cinco de Mayo celebration comes rolling in, I want to make sure that I’ve updated this blog post for your convenience. 🙂 The month of May tends to be a busier one for me in preparation for Cinco de Mayo Celebration (usually at my son’s school), Mother’s Day and my birth month (ssshh). Mexican Rice happens to be one our favorite rice recipe. It is such a flavorful rice even without the add-ins. 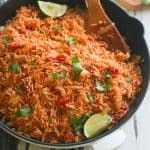 Whenever I have people coming over unannounced, I usually serve them with this Mexican Rice as the ingredients are all pantry staple and it comes together sooo easily. You can leave it there unattended as it cooks (no stirring required) as you prepare the main dish or the other sides. 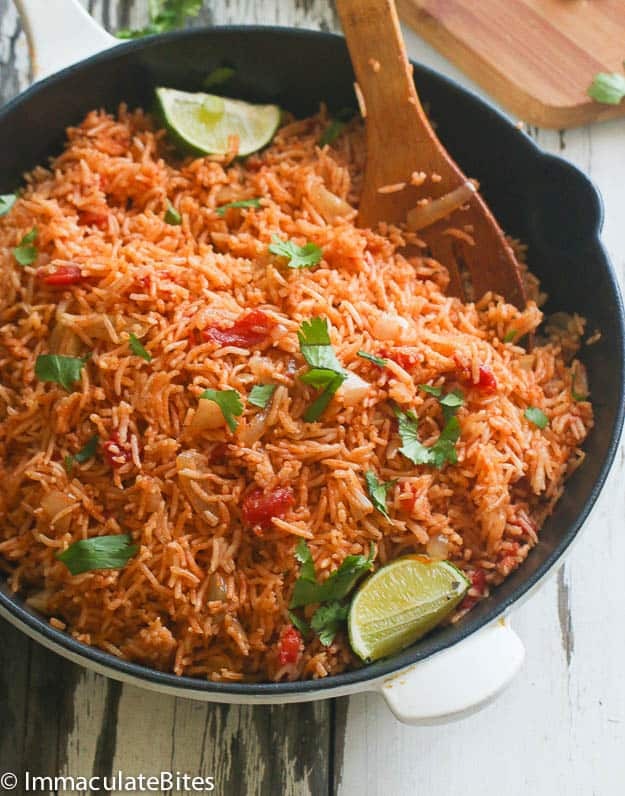 Is There A Difference Between Spanish Rice and Mexican Rice? 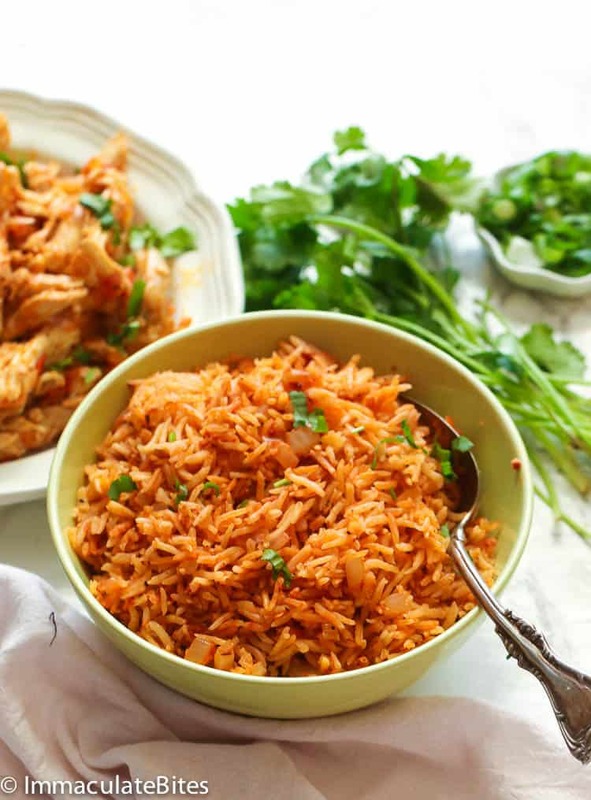 Mexican Rice is a common side dish in Northern Mexico and is also popular in some parts of the world, especially in the Southwestern U.S. It also goes by with other names such as Red Rice or Arroz Rojo. And then you add Spanish Rice into the list. Yes, Mexican rice and Spanish rice are basically the same dish although this recipe here is technically not part of the Spanish cuisine. In fact, Spain’s popular rice dish is known as Paella that uses saffron as its base which gives that distinct yellow color. 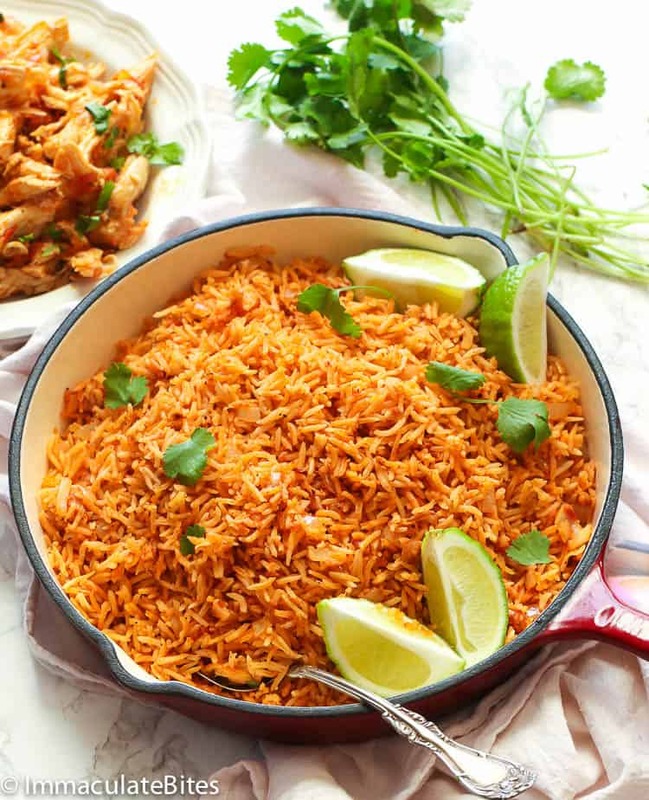 The reason probably why Mexican rice is also called Spanish rice is because it was the Spaniards who introduced rice to Mexico. Another theory is that the Mexican speaks the Spanish language which is why it’s easily tied in to this dish. Ever since I discovered how to make rice in the oven, my life could not be any better. I can whip up rice for a 100 people in a heartbeat without any worries. The perfect entertainment food! But Mexican Rice works perfectly either baked or on stovetop. But if you are one of those few who prefer it the traditional way and letting the natural break down all those wonderful flavors, then that’s fine, too. Remember these few important rules though when making Mexican Rice on a stovetop. 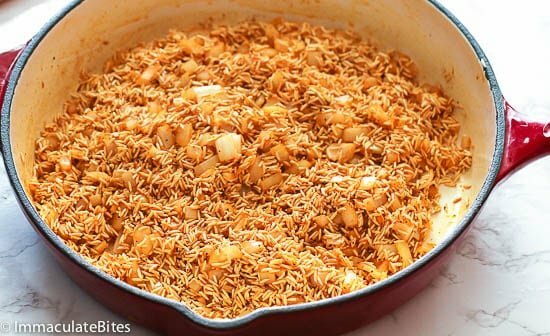 First, please do not to skip the browning or toasting the rice in fat or cooking oil as it adds that nutty toasted flavor. Second, bring the rice to boiling point before lowering the heat to simmer. 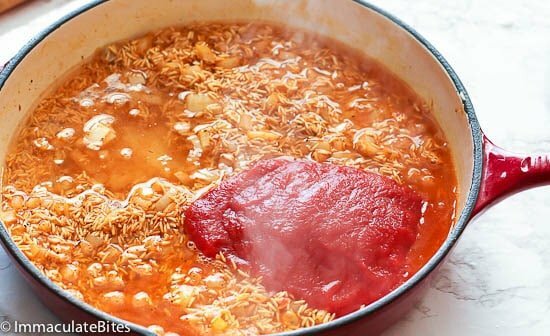 If you reduce the heat right after you add the tomato sauce and broth, you will have an undone rice in 15-18 minutes. And lastly, avoid opening the lid during cooking as it will allow the steam to escape resulting to unevenly cooked rice. Yes, you can. If you want a healthier alternative to this dish, using brown rice is certainly the way to go. Just a heads up though that brown rice cooks longer than white rice. Since I haven’t made it myself, you can start adding extra 10 minutes in the cook time, do a quick check and just go from there. One of our readers here also suggested to adjust the broth amount. For the oven baked rice, add about another 1/2 cup of broth. What To Pair With Mexican Rice? Did I not tell you how versatile this rice dish is? You can basically pair it with almost anything (I like it with grilled meat the most). Pairing Mexican Rice with classic Mexican recipes like Burritos, Enchiladas, Quesadillas, Taquitos, Chicken Fajitas (which I’ll be sharing here soon… 😉 ) are the obvious favorite options. Or you can eat it straight up! It makes wonderful mean on its own. Now don’t wait ’til May before you try either one of these methods in preparing Mexican Rice. Trust me, it’ll be your new favorite rice recipe to make. And it makes a wonderful and easy dish to feed a crowd! This post was first published on May 2014 and has been updated with new photos and additional cooking method. 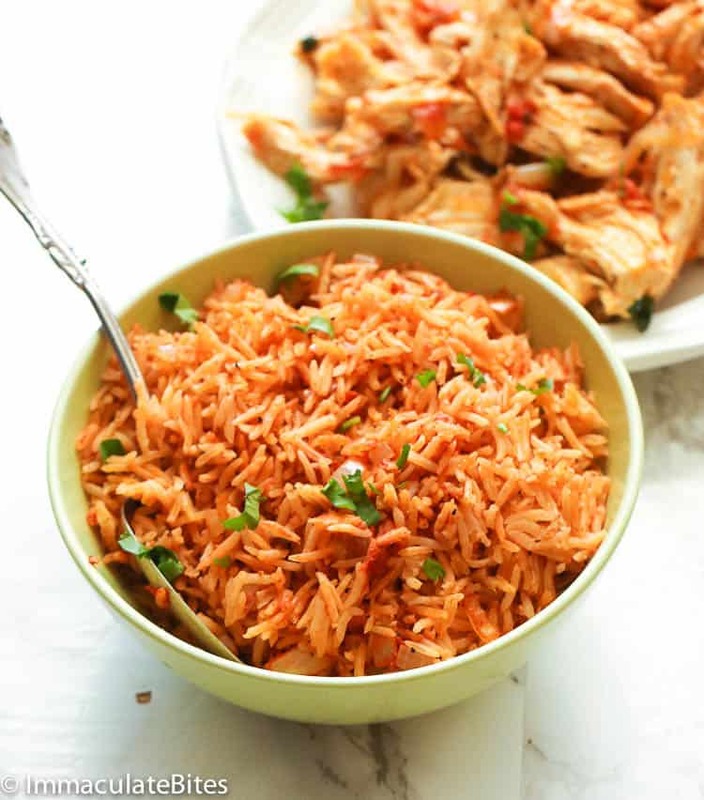 Mexican Rice - tender and amazingly delicious rice recipe that's perfect for entertaining or for regular days. It taste even better than those you pay at restaurants. Minimal prep time with optimal result - comes in 2 methods for your convenience! In a half sheet pan (12-13/16" l. x 10-7/16" w. x 2-1/2”) combine all ingredients and stir so that everything is fully combined. Cover tightly with aluminum foil paper. Gently place in oven and let it cook for about an hour. Heat oil in a medium saucepan over medium-high heat, add rice and brown stirring occasionally, for about 2-3 minutes. Next add onions and garlic, cook for about 2 minutes or until onion become soft and translucent. Season with paprika, cumin, bouillon, salt and pepper, add in the jalapenos or chili powder if using. Cook stirring often until fragrant, for about 30 seconds. Pour tomatoes sauce and chicken broth into sauce pan and bring to a boil stirring once or twice. Reduce heat to low, cover sauce pan and simmer until rice is tender and liquid is absorbed, for 15-18 minutes. Remove pan from heat, let it sit covered for 5 minutes then fluff rice with a fork or serving spoon. There are two ways of making the Oven Baked Mexican Rice. (1) You can start by sautéing the onion, garlic, rice and jalapenos on the stove before placing them in the baking pan. (2)Or you can go the easiest route by throwing everything in the baking pan and bake for about 55-60 minutes. Make sure you use a tight fitting lid to cover the rice. Based on my experience of using aluminum paper and lid. The best one is the one that comes with the pan (a matching set) or just use strong aluminum paper. You may have to double it to ensure it is perfectly cooked. At no point during the cooking of rice should you uncover the pan and or stir rice. I am not an experienced cook and was trying to use your recipe and the way it is printed, it is a guess as to how much cumin spice to use. One and one half or one half. ?? I wonder if anybody else had a problem? Hi Lee, It’s one teapoon plus another 1/2 teaspoon in total. Loved the recipe! But it didn’t cook in a hour in the oven. After an hour I took it out and it was still VERY liquidy. I ended up putting it in a pan on the stove for 20 minutes and it cooked perfectly. The guest even wanted the recipe! This sounds great. I want to decrease the recipe to serve 4 people. Should it still bake an hour? -Could this be made ahead and frozen? How do you think it would turn out reheated in the oven? -Do you think this could be made in a crock pot? Cool, portion and freeze in a ziploc bag. To reheat from frozen: Add a drizzle of water to the rice dish, then cover with aluminum foil. Bake in a 300 degrees oven for about 15- 20 minutes, or until the rice is heated through. Hello! This looks wonderful. Do you think it would be ok if I used my round Dutch oven (le cruset) for this ? How do you suggest reheating this? I want to make today to serve for a party tomorrow around lunch! Thanks! Rice dries up when it’s left over night. So it will dry up when you reheat it. If you must When it’s time to serve, place a little water in with the rice, cover it slight, and then microwave till it’s warm. OMG!. Rinsing the rice was new to me. I was so nervous trying it so I just went for it and wow it worked out! I doubled the recipe . Making 6 cups of rice at one time. The recipe worked perfect! I made 2 separate batches. I tweaked the second batch, for regional taste preference. I used 24 oz of tomato sauce (3 8 oz cans) instead of 28 ozs and 1 tsp of paprika (instead of 2 tsp for double amount). My new favorite way to make rice- in the oven! No mess to clean up! Thank you, I saved so much time using you recipe! Awesome! So happy to hear it worked out well for you. I made this today. It was great. Loved it! Awesome! Happy it worked out well for you. I had a mini heart attack because I couldn’t find this recipe, I had it saved in another folder! It is absolutely perfect and delicious. I make this at least once a month, it is everyone’s favorite in my home. Thank you! Oh No! Glad you found it ! Don’t want to hear of a heart attack Aubrey! NOOOOO. So Pleased to hear it is on your menu rotation. I have to make enough to feed about 100 people for a wedding rehearsal dinner. I’m wondering if cooking it in an electric roaster would work or if I should cook it in batches in the oven and use the roaster to reheat it at the dinner. Any experience out there with using a roaster for this recipe? Sorry I don’t. But it works great in a rice cooker too!! I would do a trial run first with the electric roaster and see if it works. If not just bake and reheat in the electric roaster. This rice is really good! How ever it was just a little under cooked in the middle. Now that being said. I want to point out that I followed the directions excactly. I used the recommended rice, tomato sauce, seasonings and made a very tight seal with tight fitting lid. What I think my problem is that all ovens vary in “true” temperature. I also needed to add about a 1/4 cup more broth/water and cook this 30 minutes longer. The recipe is spot on with flavor. It is fantastic. So please don’t take it the wrong way. I’m only mentioning this just in case someone else has some trouble like I did with it. I tried to give this 5stars but it only allowed 4. Hi Clint! Always appreciate constructive criticism, this might help another reader. Thanks for taking the time to share your thoughts with us. The second ingredient…14-oz can tomatoes sauce….Does this mean a can of tomatoes with the sauce/liquid not drained off or does it mean a can of tomato sauce??? 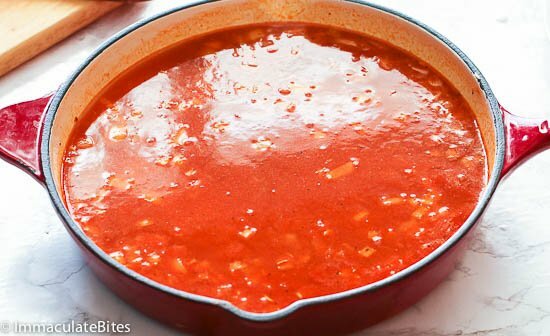 I first thought you meant tomato sauce, but then when looking at the picture of your recipe, it looks like there are actual chunks of tomatoes, which would not be the case with tomato sauce only. Please clarify. You can use either 14ounce can tomato sauce or the diced tomatoes with sauce. Don’t throw away the sauce. Yay!!! let me know which ones you try out! Thanks for taking the time to let me know. Awesome! Thanks for taking the time to let me know! So, I wasn’t kidding when I said I wanted to make this again. I made it again today. As soon as I saw your reply I went out and bought the basmati long grain rice. What a Difference it made!!!!!!! OMG it came out perfectly and the taste is even better. Thanks so much for replying! Hi! I followed this recipe to the T, and although it is VERY tasty and delicious my dish still came out sticky. I did rinse my rice several times. I’m using Goya medium grain rice do you think that is the problem? 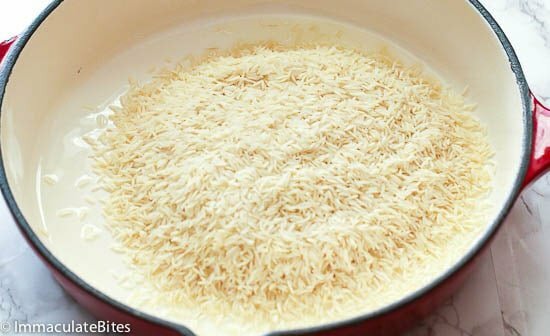 What is your method for rinsing your rice? Any help you can offer would be greatly appreciated because I would like to make it again. Hi Chris, I think the problem is with the rice. Try using basmatic rice(long grain) available in most super markets. IT works best with this rice. OK. For the doubters out there. I am a new cook (male/ divorced) and have tried and failed on several Spanish rice recipes. Rice in my opinion is not easy to cook. Last night I was at the store, and an African American Lady was buying many rice kits. I asked her how she cooks hers. She told me the oven. She said just go 350 and throw everything together. Today I tried a rice Kit “McCormick Black Beans and Rice”. I used the box as is and added 1 tbs. of cumin. I put the ingredients in a metal bread loaf pan because that’s all I had. I then covered the top with aluminum foil per your directions. Put it Into the oven for 1 hour at 350. Never looked at it while cooking, left the foil sealed. Pulled it out after 1 hour. The results were PERFECT. Awesome flavor with very nice fluffy rice. Restaurant quality. even more important than Chili Powder. Also, I found that the bread loaf pan covered in aluminum foil is just about the perfect size for using a rice kit (box with 4 servings). Thank you for your great instruction! My Pleasure!!! Thank you so much for taking the time to share your thoughts and tips with us. We Greatly appreciate it !! This sounds like a wonderful, easy recipe. I just have ONE question~ Is it okay if I use a medium grain rice such as Niko Niko brand Calrose Rice instead of a Basmati? Thank you so much for your time and HAPPY SUNDAY SUPER BOWL! GO PANTHERS!!! Yes, you can. Looking forward to the half time game! Happy Sunday. Worst recipe ever. Doubled it as suggested by poster. Never cooked all the way through. I had this cooking in the oven at 405 for 1 hour and 40 mins and the middle of the tray was still uncooked. Just all around disappointing. So sorry to hear about this. It’s really important to tightly cover the baking pan. Makes a huge difference. I make this all the time and it really turns out well. And several other readers have tried it with great results . Maybe give it a try one more time. I had the same problem, however, rather then blaming the recipe I looked at the result. My niece makes perfect rice with this recipe. She lives at sea level and I live at about 5000 feet. Maybe it was the altitude as my niece’s rice came out crunchy when she made here. Tried cooking it for 2 hours; still crunchy. Then I boiled the water before I added it to the other ingredients. Cooked it for 1 hour and it came out perfect. I just had to tweek the recipe a bit. Thanks for taking the time to share this tip with us. It’s really good to know. Am sure other readers would benefit from this too. Not much, the difference is the spice combination, which gives it different flavors. Cumin is not used in making Jollof rice. How much rice for 100 people can I use an aluminum pan covered tightly. How much tomatoe sauce and do you Brown the rice first? How long in oven? Wow, this recipe worked so well! Really tasty. I haven’t baked rice before and was nervous, but the rice turned out perfectly cooked and fluffy. When sautéing the onion, etc, I added some celery, carrot, and capsicum – I’m adding as many veg as I can to things to up my veg intake – and it would be easy to add anything according to what else you’re serving, like corn or zucchini, or different spices. As you noted in the instructions, I made sure I had a good seal on my Pyrex dish (it has a lid but it’s not airtight) by putting an aluminium foil sheet between the dish and the lid, as well as a couple of al-foil sheets wrapped over the top. Thanks for this great recipe! Martha, thanks for the detailed feedback and your add ins- will definitely be adding some of the mentioned veggies to my next rice. 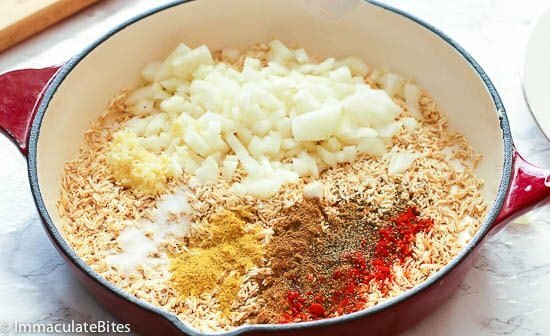 I have 100 people to feed rice to and was wondering how you would suggest I cook this recipe. I would need to multiply it by 14 at least and I know I dont have 1 pan big enough. 🙂 How many pans would you use? Sheralynne, it all depends on the guests and what other food is being served. I think 14 trays of rice is more than enough.You should make it in multiple trays. Buy the full sized trays and lids. Then double the recipe for each tray-they do reheat pretty good(just in case you are pressed for time – make it then reheat in oven). Let me know it works out for you. It turned out great! I had to add 15 min to the cook time because I cooked 4 trays at a time. Then placed it in the fridge to reheat the next day. 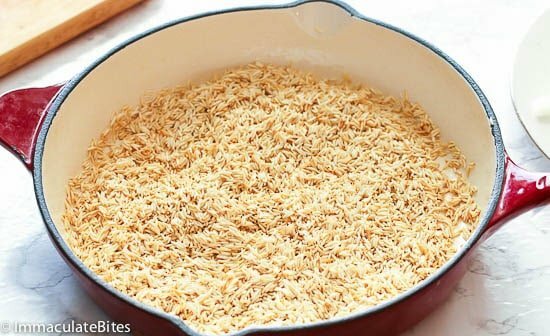 All my guest raved about the rice and we’re impressed that it was done in the oven. I am getting ready to make this recipe for the first time. I would like to make it the day before. How long did you reheat the trays for the next day? I need to make rice for 60 people. Have you ever tried this recipe with brown rice? What changes might you make. What exactly are you referring to when you say a “tray?” Is it the large aluminum rectangular tray? No I haven’t but some readers have and they recommended cooking it a little longer in the oven with about 1/2 cup more of broth. The specifications of the tray are -half sheet pan (12-13/16″ l. x 10-7/16″ w. x 2-1/2”). For 60 people, I would go with 3-4 trays of these . Depending on what you are serving them with. Happy Cooking!!! Brenda , I have never cooked rice without washing -it prevents the rice form clumping and gets rid of any dirt in the rice. In this recipe, you have to use the recommended water and oil listed above . Nothing more . It produces perfect rice every time! Let me know how you like it. I’m missing in the recipe how much water to add. I’ve read it several times but I don’t see it. Help! Hi, Michelle. That’s 4 cups of water or chicken broth. Happy cooking! oh my GOD! i love this recipe! but i am wandering. Personally i don’t wash my rice is it compulsory for the rice to be washed? And while cooking don’t you add some water or oil?